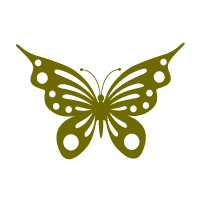 Butterfly symbol represents the soul and resurrection in several parts of the world. The butterfly in itself represents life and its cycle. The butterfly has a short life cycle and thus many ancient peoples saw it as representative of the impermanent. Its physical beauty and its nature of moving from flower to flower seeking nectar has made people to associate it with unstable and superficial aspects of the human soul. Butterfly is looked as a symbol of transformation, regeneration and flight because human souls were carried by the Butterfly from earth to heaven. In Minoan Crete and Toltec Mexico butterflies personified deities and therefore the deities were regarded as symbols of beauty, love, flowers, and the spirits of the dead. The group form Popolucas sported the Butterfly as a motif on their breastplates while in Rome it was the personal symbol of The Roman Emperor, Augustus. In Japan, after flying from the cocoon and spreading its brand new wings it is symbol of young girls which represents emerging beauty and grace, the change is regarded as joyful and not traumatic. Their favorite symbol is that of warlords.